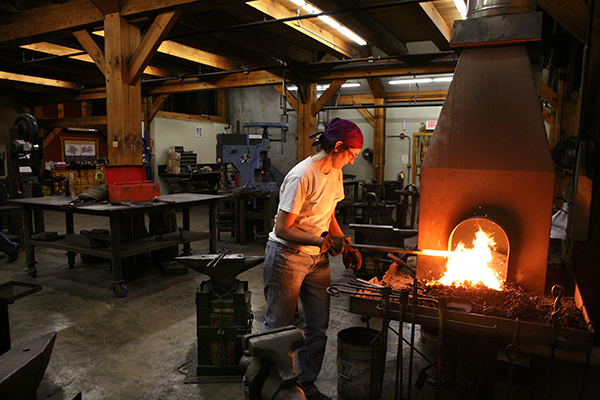 See blacksmiths in action forging items in the Clay Spencer Blacksmith Shop on October 31 at 7 p.m. 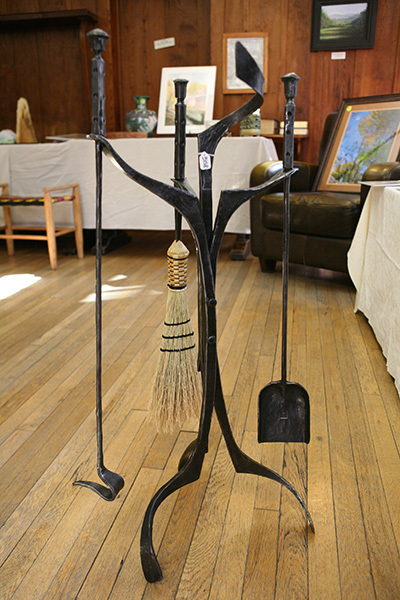 Items created will be auctioned off the following day at the Blacksmith & Fine Craft Auction. 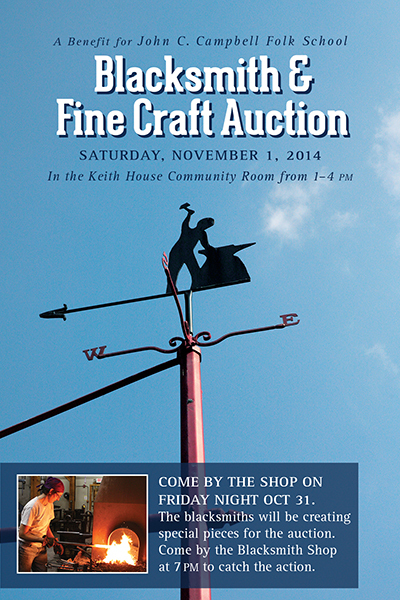 CP: So, the Blacksmith & Fine Craft Auction is coming up on November 1. 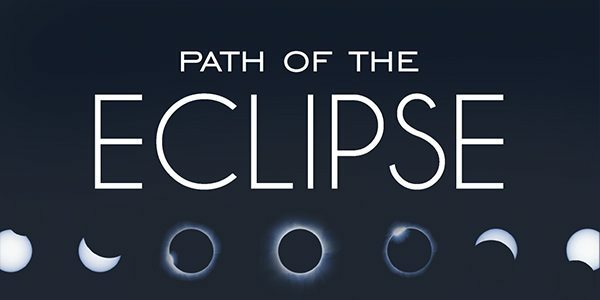 I hear there’s going to be a new special event on Friday night. Can you talk about that? PG: I can. Traditionally, there has been a joint meeting of the Appalachian Area Chapter of Blacksmiths (AACB) and NC ABANA at the Folk School during the auction weekend. The meeting is on Saturday morning, bright and early. I had been trying to think of a way to expand the meeting and make it more appealing for smiths to stay over on Friday night. Last year, we tried a small invitational Friday night “Hammer In” (A “Hammer In” is where blacksmiths get together and make things collaboratively). It went really well. We made a few things for the auction, including a fireplace set, and it was encouraging enough to try it again this year. I put the word out to members of the blacksmith chapters and we are expecting quite a few smiths on the evening of October 31st. We are opening the shop up to auction goers to come and see what’s involved in the work and to observe how the items are handcrafted. I believe it will add value and interest to the pieces if folks can see the forging process. Tim Ryan is going to have a kettle of cooked goodness to offer up for a small cost per bowl. It’s gonna be fun! We are going to have a few set projects: a fire tools set and maybe a sculptural piece. Blacksmiths can forge smaller items too. It’ll be a good crowd. CP: So it sounds like an auction pre-party, on Halloween nonetheless! Bell, hook & anvil, perhaps? PG: I don’t think were are going to have anything specifically Halloween themed, but you never know at the Folk School! The Blacksmith Shop is a good place to spend Halloween. Maybe we will even have some candy. 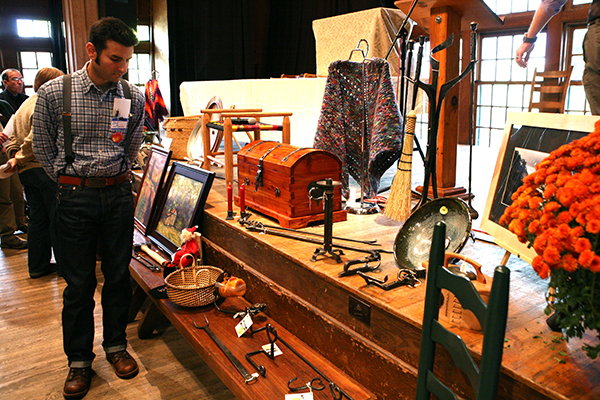 CP: Where does the Blacksmith & Fine Craft Auction get its name? PG: Years and years ago, maybe in the late 1970s – I’m not exactly sure went it started – there was no money here for the programs, so some Blacksmiths got together and had their own auction to buy tools and materials for the shop and it just grew from there. Now the Auction has grown to benefit all the programs including the Blacksmith program. CP: On the poster what are we looking at here? PG: The weather vane featured on the poster this year is here outside my shop (the Oscar Cantrell Blacksmith Shop across the street from the main studio). It is an old gas station sign pole with a little weather vane on the top of a man forging at the anvil. I’m not exactly sure who made that or when – it’s been around here a long time. 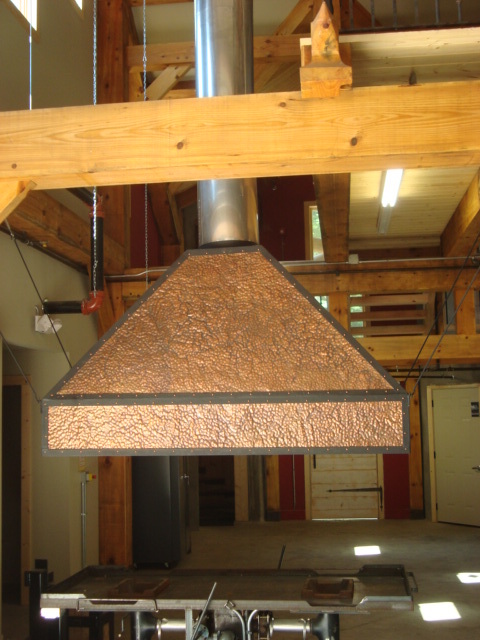 I do know it was constructed and installed during a Blacksmith Work Week. CP: Has the weather vane ever made Mary Poppins come to the Folk School? PG: (Laughs) Not that I know of! CP: How was Fall Festival this year? PG: We had a great Fall Festival! The weather was wonderful and I had some good help with my booth this year from Lauren Kelischek. Lauren redid the whole booth and it really turned out well. One little kid’s mom told me that her son wanted to be a blacksmith when he grew. He watched me forge a nail and when I handed it to him he lit up. That’s one of the best parts of Fall Festival for me. I like having all the kids come around and and watch while I demonstrate making hooks and nails. 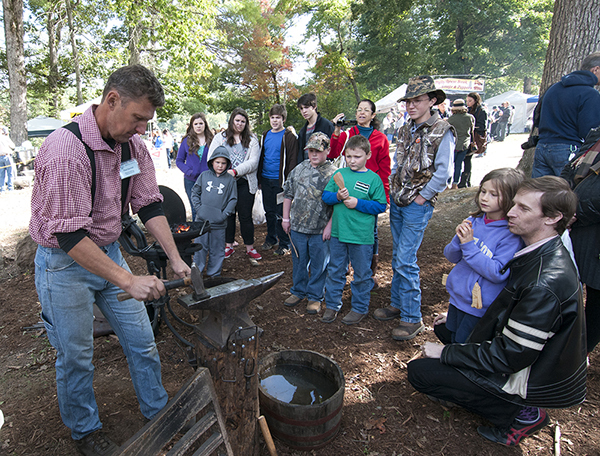 Paul demonstrates how to make a nail at Fall Festival 2014. CP: Are you working on any fun projects? PG: Now that it is fall and it’s getting to be the fire season, I always get alot of fireplace doors orders and tool set requests. I have an interesting copper repoussé project that is going to go into Annie Ciacle’s fireplace door set. I’m working on that today. I’m also working on a prototype of park bench legs for Kim Joris. It’s for the You Can Sit Here With Us project, an anti-bullying campaign Kim runs. CP: When is your next class at the Folk School? PG: I have my Arts and Crafts Ironwork class coming up in February. This will be my third time teaching it. I am pretty excited about some new projects. We use Arts and Crafts style as an inspiration to create pieces in the spirit of Greene & Greene, Stickley, Roycroft, and others. It’s intermediate to advanced, you need to have some experience. 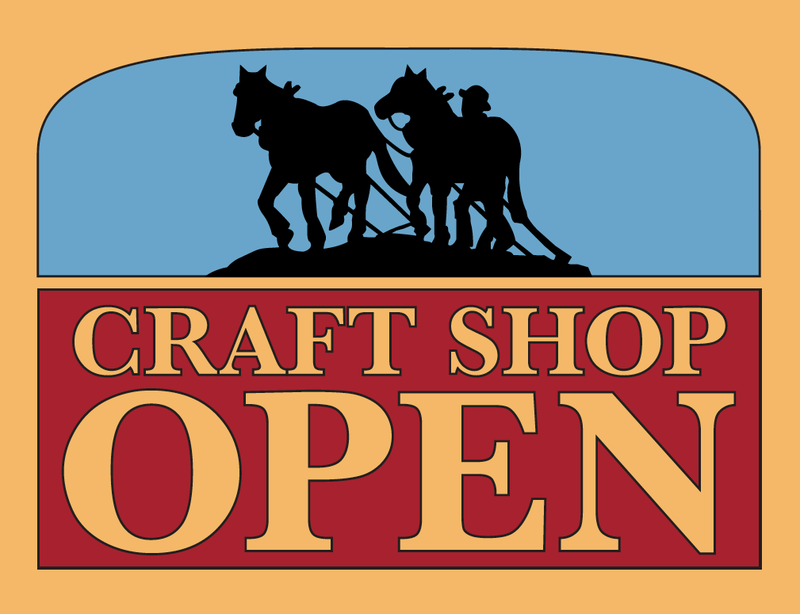 Join us for a fun afternoon of fine craft and camaraderie while supporting the Folk School’s craft programs and the Clay Spencer Blacksmith Shop. Bid on beautiful works donated by instructors and artists from the Folk School community—clay, ironwork, basketry, jewelry, weavings, rugs and much more. Please visit FolkSchool.org/Auction to view a list of items and to learn more about our eBay auctions (online auctions start October 29). Auctioneers Bob Grove and Tim Ryan will lead the bidding. For more information, please call Reed Caldwell, Development Manager at 800-365-5724 or visit FolkSchool.org/Auction. On Friday night, Oct 31, at the Clay Spencer Blacksmith Shop, smiths will be creating special pieces for the auction. Come by the shop at 7 p.m. to watch the action. Craft Shop Labor Day Sale!